I discovered that MG likes to roll around when she sleeps, and several times I jerked awake just in time to push her back from the edge to keep her from plummeting off of the side. I was so worried she was going to roll off the seat or plunge head first between the seat and the arm rest that I ended up laying down on top of her legs with my head in a squenched up position. So maybe I should say everyone ELSE got some sleep; but let’s be honest, I was too excited to sleep anyway! After making it through customs in Chicago (not a super fun experience), we boarded a plane to head to Houston, and all of our seats were spread out all over the plane because of having to book flights on such last minute notice. We looked like the Griswolds with all of our carry-on’s and backpacks, and Mia Grace strapped to the front of me in her carrier. We all somehow miraculously ended up together, and thankfully, we all fell asleep for most of that flight as well. When we stepped off of that plane onto Houston soil and came down that escalator hearing cheers and seeing signs of “Welcome Home, Baker Six!” and “Mia Grace” held by people we love dearly was unlike any other experience I have ever had and one I hope to never forget. Here was this little person on my hip who had no idea who any of these people were, had never, for all practical purposes, stepped foot outside of her orphanage in China, and now was an American citizen, a member of a big, loving family and part of a support network of friends who will love her and go the extra mile for her until the day she dies. It was such a beautiful, powerful picture of the body of Christ to Jason, me, and our entire family. MG had done nothing to earn or deserve the love that was poured out on her that night; all she did was just appear. She was simply was a recipient of…Grace, that word that is in the middle of her name and smack dab in the middle of adoption. Adoption is simply a gift of grace, to a child, and to the family who gets to adopt him or her. I am constantly reminded of that fact every time I look at her and see my own inability to help or save myself and then remember the One who risked it all to come to get me out of the hopeless situation I was in to make me a part of His family and a citizen of His country. Thank you, thank you to each one of you who came out to welcome Mia Grace and our family home that evening; we felt so deeply loved. And it was pure joy to finally see her with my own eyes in the arms of people I love so very much. And I cannot wait to introduce her to those of you (including many family members!) she has not met yet who will play such an important part in her life. Your prayers and encouragement throughout this journey have been monumental. …and headed…home. Some wonderfully fun and creative neighbors decorated the outside of our house (thank you, McDaniels! ),some very thoughtful nephews decorated the inside (thank you, Ty and Wes! ), and Aunt Ana stocked the fridge and printed out pictures from our trip to have when we walked in the door – I was absolutely blown away by everyone’s thoughtfulness! Grandparents were there to greet us, and Mia Grace settled right in to Nana, Papa, Mia and Popsie’s arms like they were people she had always known and loved. It was truly so very good to be…Home. Pretty sure the Walmart at Beltway 8 and I-10 didn’t have a section like this the last time I checked. 4. Pack your bags to come HOME!!! And reach into your deepest memory to remember how to pack a diaper bag for an 18 month old for a fifteen hour flight. If you hear the sound of someone crying, that would be me sitting here on my couch in Guangzhou thinking about that flight! 6. Go look again at your ultimate gift and thank the Lord one more time that you get to really bring her…Home. Tomorrow morning we have an early car ride from Guangzhou back to Hong Kong and fly out of HK around 11. We land in Chicago around 2pm on Friday, the same day, and then take a flight to Houston, landing at 8:15pm. We cannot wait to see family and friends and finally have MG meet the people who have prayed for her and loved her along the way. We love each of you so and are so thankful our next post gets to be from the USA! Thank you for your prayers for yesterday! Our appointment at the consulate went so well – it was smooth with no glitches! Mia Grace’s visa should be ready for pick up this afternoon, and the moment she steps on US soil and goes through Customs and Immigration, she becomes a U.S. Citizen! Whoo hoo! That moment will be a tremendous moment for us all. There was something profound about physically being in another country but stepping into a refuge, so to speak, where you were reminded of your citizenship with all of its rights and privileges in another country. There was also something profound about stepping into that consulate building with a Chinese baby with a Chinese passport in our hands and stepping out with a baby who has an American visa and in a matter of hours will become an American citizen, all because of the ctitzenship of her parents. It gave us a longing for home, and Jason has been singing the old Larry Gatlin song ever since: “Houston…Houston means that I’m one day closer to you…” Can I say Amen to that!!! We are ready, ready to be home. Please pray for our last day of packing and tying up loose ends here. Our guide, Lily, is set to pick up Mia Grace’s visa this afternoon, so please continue to pray that process continues to go smoothly. Also, please pray for Adam, Kelly, and their daughter today. They fly home today at 11:40 and their little one has had a tough few past couple of days. She has a really tough time on elevators and small spaces, so the plane could be particularly daunting. Please pray for grace and mercy at every turn and for every need and that their baby would SLEEP on that airplane the whole way home!!! We love and appreciate you more than words can say! Thank you for coming next along with us on our journey – your encouragement and love has made all the difference in the world. I forgot to add that tomorrow morning is our appointment at the American Consulate here in Guangzhou where they process the paperwork to issue her a visa to enter the USA. Would you please pray for a smooth appointment in the morning? For no administrative glitches or shuts downs with the computer system? Please pray her visa is issued in a timely manner and we are able to pick it up on Thursday so we can depart and leave to come home on Friday morning. We have learned the hard way the importance and power of prayer through each step of the adoption process. We love and appreciate you; thank you for praying! We woke up this morning to a steady rain that lasted the whole day. We had plans to go back to Shamian Island this morning since Jason and Lillian were feeling better and had missed going on Sunday. The Island is mainly an outdoor area to enjoy, so we borrowed umbrellas from the Hotel and made our way through the wet to show Jason and Lillian the things we enjoyed so much on Sunday. The famous White Swan Hotel is on the Island (the Hotel where most adoptive families stayed up until about three years ago when it closed for renovations), so the shops there are well supplied with clothes for little girls. Each of my girls picked out a traditional Chinese dress and a parasol. They were beyond excited to try out their new purchases! And when Mia Grace woke up, she joined the fun! Every day we see Mia Grace let a little bit more of her guard down, become a little more expressive of her wants and desires and join in the overall family chaos with an occasional flicker of a smile. This morning as Jason tickled her, she laughed her wonderful belly laugh, looked at him seriously, and then gave him a grin. We never saw it again the rest of the day, but we will TAKE IT!!! Every sign of joy is a great gift and a direct answer to prayer. Thank you for your prayers today not just for our family but for the other families we have met here as well. I did not see Kelly and Adam again today but we have plans to see them tomorrow, and I am hoping for a good report on their daughter. I know your prayers are making a profound difference. We love and appreciate each one of you so; only three more days until we come HOME!!! Today we rode a cable car up a mountain about twenty minutes from our hotel called Bayun Mountain. We spent about two and a half hours walking on different trails around the mountain, seeing lots of signs for everything from a Natural Bird Sanctuary to an Exercise Center to Temples, but we never were able to find much of anything. Despite our inability to navigate using Chinese characters on signs, we enjoyed the cool mountain breezes and green trees up above the heavy city heat and pollution. But the real highlight of the day was dinner when we ate with an adopting couple also staying at our hotel. Their names are Kelly and Adam, and they are from the Midwest. They are with a different agency, but they were at the adoptive center at the same time as we were last Monday and we both got our little girls at the exact same time. Their daughter has cleft lip and palate, just like Mia Grace, only she has not had her surgery yet. And while Mia Grace came to us as silent as the grave, their little one began to cry from the get go and hasn’t really stopped. Kelly and I have had snatches of conversations in the lobby or at group paperwork appointments over her baby’s head as she rocks, bounces, soothes, kisses, and wipes away tears. To say I like her is an understatement. She has the patience of Job and is truly a kind soul. Their daughter was in a really tough orphanage situation and has developed a lot of self-soothing techniques, fearful responses, and grief. She is a beautiful little girl behind all of her tears, and Kelly and Adam know it is just going to take time to slowly bond, attach, and build trust and love. They both are strong Christians, and their rock solid faith in the sovereignty of God is such a day in and day out testimony to our family here in Guangzhou. Every day, we meet more families like Kelly and Adam who are willing to risk big and love well. There’s the family I met at breakfast yesterday who is here adopting their 10th and 11th child, a three year old boy with dwarfism and a five year old girl with hydrochiphilis. The mom is one of the most joyful people I have ever met. There’s the family who was also with us on Gotcha Day who has two biological boys at home and is here adopting an 11 year old boy with CP. And then there’s the family I met at the pool yesterday (we spend a lot of time at the pool – it keeps the girls from scaling the walls of our apartment). They are here adopting a little girl a few months older than Mia Grace and are from Mississippi. They sound about as Mississippi as one can get, and I love hearing their accents. He loves to fish and hunt and farm and watch football, and she’s from a big family in Starkville…and they live in Northern India. They have given their lives to proclaiming the Gospel of Jesus in one of the most unreached places in the world in a place where they are literally the only foreigners. And these families are just a few of the families represented here at this hotel. Every family has a story. Every family has had to count the cost to be here. And every family I see or meet displays a little bit more of the radical, beautiful, redemptive, sacrificial love of the love of Christ. I am in the minor leagues when it comes to sacrificial love – the Single A team (anyone who knows me well can tell you that – sacrificial love isn’t exactly my forte). But many of these families are in the Majors, and all I can say is that it is a privilege to watch and be humbled and challenged by their courage and self-forgetfulness for the sake of another. Would you please take a moment and pray for Kelly and Adam and their daughter? Would you pray for healing and trust and deep attachment to form quickly? Would you pray for strength and continued trust for their family and for signs of progress to continue to be evident every day? Thank you all for continuing to pray for us the last two days. Both Lillian and I are definitely feeling better. Our fever is gone but our stomachs still continue to give us fits. Jason started feeling off yesterday, and he was pretty much down for the count today. Thankfully, we have always had one parent who feels well enough to care for everyone and Lizzie, Caroline, and Mia Grace have stayed healthy. Please continue to pray they stay that way and that Jason’s stomach heals quickly. Thank you!! Last night I fell asleep before I was able to blog, so I will catch you up on our day yesterday (Saturday) and then fill you in on today. So many firsts are happening around here – it’s been a fun 48 hours! Yesterday morning started with a bottle and long hug from Daddy. Mia Grace loves to get quiet and still and nestle in close. We are soaking in having a little one again who fits into the crook of your arm. Our big outing of the day involved going to see the 2000 year old tomb of a king who ruled and reigned in the Guangdong province. What was the king’s name? I have no idea. What were his feats or accomplishments? I have no idea on that end either. To be honest, it sounded like a great way to pass the time (we’ve only been here in Guangzhou now for 8 days with five more to go, but who’s counting?? ), and if something has been around for two thousand years, I thought it was probably worth seeing, especially since I know so very little about Chinese history (I sound like a great home school mom, don’t I? Maybe I should have my Aunt Ann come in and teach history instead of her niece ). And here are the dead king’s teeth…sorry, gross, I know, but I figured if I had to see them, you should have to too..
After the tomb, our guide took us to the Pearl Market. I was expecting a few stalls with merchants selling pearls but was amazed to step into a multi-leveled building the size of the Galleria with store after store of merchants selling every kind of gem imaginable. The girls were in awe and Jason was very nervous with so many girls around him who all like jewelry! To say the least, MG LOVED her fries and ate, or should I say gnawed, every last one. I had to pry the last remaining stub of a fry out of her hands after an hour. But the real firsts came today (Sunday) after nap time. We walked down to the hotel pool to watch L, L, and C swim, and as we approached the side of the pool, MG’s eyes got wider and wider and wider. And when Caroline jumped in right in front of her, Mia Grace must have jumped a foot in my arms. I could feel her little heart racing underneath her shirt. I think the sight of a large body of water with people jumping in and disappearing underneath the surface with a loud SPLASH absolutely startled and amazed her. It only took about 30 minutes, though, for her curiosity to overcome her fear. We made our way down to the baby pool and she stood on the edge looking in. All of a sudden, she was trying to climb over the ledge and hoist herself into the pool! All this willpower from a little thing who has yet to really smile or give us more than a tiny peep for a sound! So off came her clothes and into the pool went MG in her diaper…and she loves every second of it! Kendall, Kathy, and Jenny look out: you have another Baker swimmer on their way to your house! Thank you, thank you for your prayers today. The Lord was gracious, and all six of us were able to go to visit the orphanage today – the Guangzhou Social Welfare Institute. Lils and I were barely hanging on by the skin of our teeth at times, but we made it. Today was another sobering day, for many reasons, but it was also a day full of gratitude as we realized more of where Mia Grace has come from and where we are bringing her to. The woman who met us at the front gate was the same woman who placed Mia grace in our arms on Gotcha Day. Her name is Wendy, and she has worked in the orphanage for ten years. She is a really special person and she helped to answer so many of our questions about Mia Grace and orphan care in general. The first place she took us was the picture at the top – the baby hatch, the place where Mia Grace and so many other babies were “dropped,” or left by their parents. This was probably the most emotional place to see. Most parents who drop their babies are from rural areas that do not readily have access to medical care for babies with special needs. This was, most likely, the case with MG’s parents. I do not know their specific reasons for leaving her at this station, but I could almost feel their heartache standing there. I pray for her parents frequently, particularly her mom. I long for her to come to know Jesus Christ. Seeing the baby hatch today only intensified that prayer. Wendy told us that in 48 days, they had 200 babies dropped or abandoned. Because of that, they had to shut the hatch down and are thinking of other ways to try to help and educate these parents from rural areas. The writing on the side of the hatch reads something like, “Parents, please stop and consider. Do you really want to leave your baby? A parents’ care is much better for a child than an orphanage.” What heartbreak that small hatch has seen. As we walked away (and honestly, I really wanted to run away – standing there thinking about Mia Grace being abandoned, or any baby for that matter, was a thought I could endure for only so long), we turned towards the front entrance to the orphanage. The orphanage itself is located on the outskirts of Guangzhou in a more peaceful, rural area than the packed, dense area where our hotel is. I was thankful for the sight of green plants growing in peaceful fields. And we found out that Mia Grace had a foster mother for a month after her surgery, and her foster mother was the local farmer. Maybe MG will end up with a green thumb! …and then walked up a flight of stairs into the main building where the children live. Our first stop was the room where MG spent many of her waking hours. It was the baby room, a room full of babies 3 and under. There were women in the room called “grandmothers,” and they work for an organization called Half the Sky. There is 1 grandmother for every two children, and they spend eight hours a day with the children. We had the opportunity to meet MG’s grandmother who loved on her, patted her cheeks, rubbed her head, and was genuinely excited to see her. I am so thankful for that woman and the time she spent with MG. Mia Grace didn’t bat an eyelid through the whole affair and calmly sat observing everything from her perch in the baby carrier. But the sweetest and saddest part of the day was seeing the other children at the orphanage. There are 1000 children at this particular orphanage, and each one of the faces we saw was beautiful. Taking photos of the children was not allowed; I wish I was able to send you images of their faces. Many had some sort of mental or physical handicap, particularly the boys. Beautiful little girls stated at us out of the same somber eyes that Mia Grace looks at us with, and little boys shyly gave us high fives or submitted to having their head rubbed or patted as they passed by. I’m not sure which was harder – imagining Mia Grace being there or leaving the 999 children who were still there behind us. Wendy told us that every year, about 60 children are adopted from the Guangzhou Social Welfare Institute, mostly by Americans. 60. With 1000 children still there. In one orphanage. In one city. In China – a country of over 1 billion people. I promised myself that this blog would not be something that hits people over the head with petitions to adopt, so this is the only time I am going to say this. But please hear me on this: the Bible is clear that we are to take care of widows and orphans. In other words, for Christians, it’s not an option of whether we feel called it to orphan or widow care or not. What it comes down to is just simple, plain obedience. I know there are many ways to care for widows and orphans and adoption is certainly not the only way. But it certainly is one way. And what I want to say is this: if you or your spouse feel any movement towards adoption, any push, pull, or openness from the Spirit of God, keep walking through that door. We serve a God who is big enough to shut the door on your behalf if it is something you are not supposed to walk through. But if you are meant to keep walking, just do it one step at a time. That’s what I had to do. I finally had to stop waiting for some big “call” to adopt and just had to take the next step of obedience…and then the next step…and then the next step. The fear never totally went away and at times seemed to be downright overwhelming, particularly the morning of Gotcha Day. I almost had to start blowing into a paper bag. But at some point as believers in Christ, obedience has to trump fear…and we begin to walk forward. But go ahead and take the next step and have that conversation with your spouse. Or maybe just start quietly praying for your spouse. Or call the agency. Or meet with a couple who has adopted. Or if adoption isn’t the way you are to take care of orphans, ask the Lord to show you the way, and trust that He will. But whatever you decide to do, simply decide to take the next step, and see where it takes you. There. I said it. Thank you for taking the time and space to read and to listen. The faces of those children today compelled me to say it. I know the Lord will show each one of us how and when and where to take the next step. I am off to bed, hoping tomorrow Lillian and I are truly are virus free. Thank you for your prayers for us today. They made all the difference. I woke up around 1 or 2am with aches, chills, and a fever. Not exactly the best way to start off an expedition to the zoo. Jason definitely deserves Trooper of the Day award, because he went ahead with the scheduled zoo trip and took all three big girls. Mia Grace stayed here with me and we spent the day in quiet rest together. She slept on my chest again for her nap for over two hours, we read books, and got to know one another just a little bit more. I wish you could hear firsthand Jason’s stories from the zoo. In a city of @ 19 million people, he said 10 million of them were at the zoo since today was a public holiday (we did not know that- hah!) and of those ten million at the zoo, at least 5 million wanted their picture with the girls. There is a priceless picture he took on his phone of a guy taking a selfie with his arm around Lillian. Lils was innocently looking at an animal exhibit and had no idea this guy wanted a picture. If there were 100 animal exhibits at the zoo, the girls were the 101st. They saw koala bears, panda bears, twin white tiger cubs, and life-like dinosaur exhibit straight out of Juraissic Park. In Caroline’s words, “It was very neat but very freaky.” I think she needed Sam, Gray, and Seth there to have her back just in case the dinosaurs stepped out of the exhibit! When everyone trooped in from the zoo, hot and sweaty (weather and temperature here is a lot like Houston, but if it’s even possible, even MORE humid! ), Lillian said she wasn’t feeling well and spent the rest of the afternoon/evening on the couch. So…as if you all haven’t already prayed enough to last a lifetime for the Baker Family, I am humbly asking for more prayer. Please pray that Lillian and I wake up healed, rested and refreshed in the morning and that no one else catches whatever virus or bug we have. 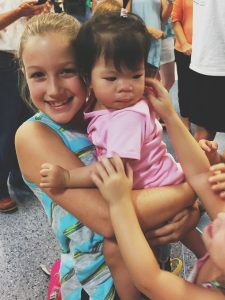 Tomorrow is a special day – we get to go see Mia Grace’s orphanage and meet the women who cared for her, so apart from Gotcha Day, this is the day I have been anticipating the most. Thank you, thank you for letting me ask for prayer and for being friends and family who I know will pray. And speaking of prayer, your prayers for Mia Grace, so beautifully expressed in your comments and emails, have been powerful and effective. As much as I wanted to take her to the zoo today, I think our time hear together was more effective. For the first time, when she was bonked in the head by her sisters (on accident of course), SHE CRIED AND WANTED TO BE COMFORTED! Huge progress! And at meal times, she fed herself a few bites for the first time, picking up a piece of cantaloupe she wanted and taking a huge bite out of it. She also almost, almost gave me a smile. I was singing to her changing her diaper and the edges of her mouth in the faintest way started to turn up. They quickly went back down into her somber expression, but hey, we will take it! One day at a time. God is definitely moving through your prayers.